Angry IP scanner is a very fast and small IP scanner. It pings each IP address to check if it's alive, then optionally it is resolving hostname and tries to connect at specified in Options dialog box TCP port. The program uses separate threads for each scanned address to reduce scanning speed. It can also display NetBIOS information: PC name, workgroup, currently logged user and MAC address. Version 3.5.5 is a freeware program which does not have restrictions and it's free so it doesn't cost anything. 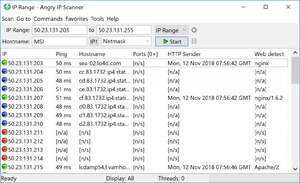 For security reasons, you should also check out the Angry IP Scanner download at LO4D.com which includes virus and malware tests. Additional screenshots of this application download may be available, too. Angry IP Scanner has a presence on social networks. Angry IP Scanner download been highly rated by our users.